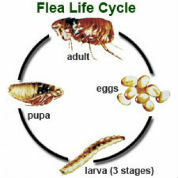 Flea may be dismissed as a small pest but it is extremely dangerous. This is because it will not only attack your pets but you as well. Due to this reason, flea infestation requires a lot of skills and expertise that can only be found in an experienced and reputable company like ours. The process of flea extermination requires a well laid out plan so that they are completely eliminated from the pets as well as any other place that they might have tempted to make a home within the house. Having the skills to identify flea infestation in good time will let you seek the services of a flea exterminator in time so that you avoid the infestation from spreading further. The process of identifying an infestation is however not difficult. Just watch on the behavior of your pets. If you see them scratching themselves or grooming a lot, this could be a sign that they are not comfortable with the fleas sprawling their belly. All you have to do is to lay the pet on their back and visually inspect their fur under their belly to see if you can notice the presence of fleas. The other method is to look out for flea dirt. These will appear like coarse ground pepper and will always be present in the places where your pet likes spending time. 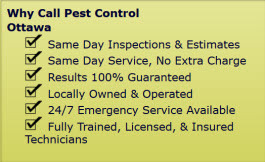 Our flea pest control services have by far been hailed as the best in the whole region of Ottawa. But that notwithstanding, we will give you the best flea extermination services that you can imagine of. We have experienced and highly trained staff who will observe a lot of professionalism while conducting the extermination. We will also inspect the immediate surroundings of your environment with a view of establishing the causes of such infestations so that we prevent any future occurrences. We simply represent the best option for your flea infestation problems in Ottawa. 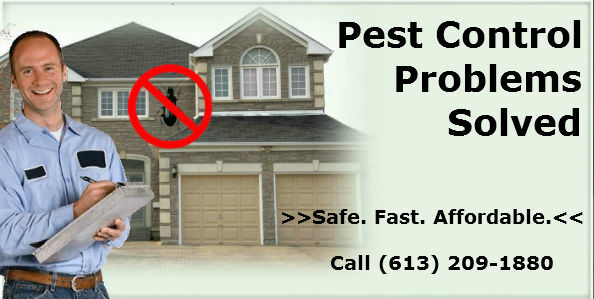 Feel free to contact Pest Control Ottawa today for more information. Our service area includes Ottawa, ON and the surrounding areas. Flea Extermination and Pest Control Services in Ottawa, ON call (613) 209-1880.